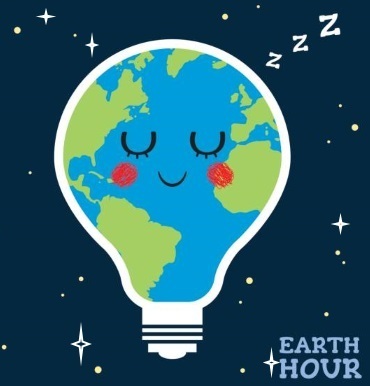 Earth Hour 2019 is scheduled for 30th March. From 8:30 pm to 9:30 pm every year since 2008 on Earth Hour Night I turn off all the lights, TV, radios, etc. in the house and sit in the quiet dark and contemplate what changes I could make that would be less destructive to this planet we call home. I love the dark and how the stars can be seen once there is no light pollution. I had a naive idea that all the lights in the neighbourhood would go out and I would see how the sky should look. How naive was I? I still turn off the lights and tv though and add at least one new thing each year that can ease my impact on the planet. So what is Earth Hour? Earth Hour is a worldwide movement organized by the Word Wide Fund for Nature. (WWF). It was started as a lights-off event in Sydney, Australia. in 2007. Since then, it has grown to engage more than 7,000 cities and towns across 187 countries and territories to raise awareness for energy consumption and effects on the environment. When Earth Hour was first unveiled by an Australian ad agency in 2007, global atmospheric concentrations of carbon dioxide had reached 385 parts per million, their highest level in some four million years. Since then, CO2 levels have broken through the symbolic 400ppm barrier and continue to rise sharply. The impact has been stark. Eight of the ten hottest years ever recorded have all occurred since 2007. Last year smashed all previous records, pushing Earth systems into what the World Meteorological Organisation this week called “truly uncharted territory”. It is simple. We need to impact less on the planet. So tonight, once again, I will turn off the lights and sit in the dark to see what else can I do to can for this planet that is my home. I may be only one but if we add the ones together so much is possible. Remember an ocean is made up of uncountable drops of water, a beach is made from millions and millions or single grains of sand. We can turn things around if we set out minds to it.